We hope that you are enjoying your brilliant new Build-A-Block™ patchwork system? There’s no doubt that your imagination is fired with lots of project ideas, but is a tablet case on the list? If not add it in! Our fifth step-by-step guide in our dedicated project series details how you can make this pretty alternative to other protective tablet covers… It could make the ideal gift for the person who always seems to be scrolling away on theirs! 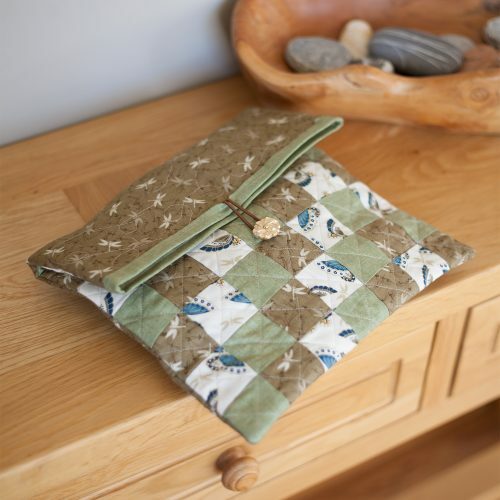 This tablet case will help you familiarise yourself with cutting simple squares and sewing them together to create your own patchwork fabric. To make the tablet case you need to use the 1.5” square die from the Build-A-Block die set. Using a 0.6cm (¼”) seam, sew the die-cut pieces together as follows, pressing seams open and flat to create a repeating pattern with the fabrics. Sew all the rows together to create a front panel that’s seven square blocks wide, and nine square blocks high. Give the front panel a good press with a dry iron (not ironing). Fuse the fleece cut in Step 4 onto the wrong side of the front patchwork panel and the backing fabric. Quilt the front and back panels as desired. With right sides together, sew both the front and back outer panels together around the sides and bottom edge only. With right sides together, sew the two lining pieces together down each side and across the bottom, leaving a turning gap in the bottom seam. Attach the hair bobble/elastic to the centre of the top edge of the back panel, securing it in place with a few stitches. Place the lining into the outer case with the right sides together and sew around the top opening, attaching the lining and outer panels together. Use the turning gap in the bottom seam of the lining panel to pull the outer piece through so the right side is showing. Using a pointer tool/crochet hook/turning stick, gently press out the corners of the tablet case. Press the case with a hot iron and close the turning gap in the lining by hand or machine. To finish, stitch a button in place on the front panel to secure the fastening loop.